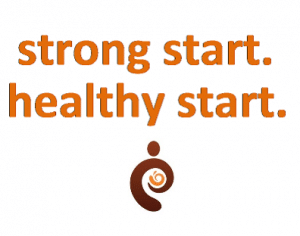 Just B Yoga is partnering with the Healthy Start program through the Ingham County Health Department to provide yoga to help encourage healthy lifestyles and fitness. Healthy Start is a national grant program to improve the health of the community focusing on expectant mothers and those with children under the age of 2. There are Healthy Starts all across Michigan including Detroit. Sault St. Marie, Grand Rapids and Flint, according to Tamara Brickey, Health Educator for the program. The main focus is reducing infant mortality. Brickey said Ingham County has higher rates of infant mortality than the national average. And unfortunately, in Lansing black infant mortality rate is four times higher than their white counterparts, she said. Healthy Start also includes education and programming for healthier lifestyles, fitness, food and more. “We are trying to build a sense of community among these women to instill they are not alone. The program is young in Ingham County. The grant was received in Fall 2012 and programming first began last summer. They’ve had walking clubs, Zumba and other exercises. “We have a core group of women who keep coming,” she said. The yoga classes are accessible to all levels and abilities. Benefits include stress-relief, stretching and flexibility and increased focus. They publicize the programs door-to-door, with fliers and word of mouth. Ultimately Brickey would like Healthy Start to be as well-known as Head Start, the early childhood education program for low-income and disadvantaged children. “We’d like to have our reputation in the community to have people recognize the name for prenatal services,” she said. She said she’d also like to see Healthy Start eventually work in schools, as well as create a fatherhood initiative. “These men are a vital part of the support,” she said. Just B Yoga & Tai Chi LLC is a donation-based, community-driven full-time studio in REO Town in Lansing. We offer workplace programs, custom off-site programming and in-studio workshops and special events. Our teachers are certified instructors. They also have CPR and First Aid certification and have passed criminal background checks.